All of the Pentagon’s investments are limited to offensive weapons designed to execute the invasions of other countries. For example, who needs stealth aircraft to defend their territory? Washington is the only owner of nuclear aircraft carriers escorted by dozens of cruisers, destroyers, amphibious assault ships, and nuclear attack submarines capable of attacking any point on the globe. The US also wields a huge fleet of over 500 heavy cargo planes specifically designed to carry armored divisions tens of thousands of kilometers away from the American continent. Russia, surrounded by NATO military bases, is seen by Washington as a huge booty given its huge territory on which 60% of the Earth’s mineral resources, drinking water, land suitable for agriculture, and forests are located. After the collapse of the USSR, when the United States was left as the only superpower in the world, the cliché was established whereby Washington proposes a military invasion of another country. First it creates a psychosis among public opinion that the given country is on the verge of attacking and occupying its neighbors. When in fact the US military is invading the target country, this process of psychological warfare conducted intensively by subservient media presents US military aggression as eliminating the threat of the neighbors’ target state. As for the US, in reality the "cold war” never ended, and over the past two years has triggered a psychological war against Russia and managed to oblige the EU and other vassal states to impose economic sanctions. In order to prevent Russian influence from expanding following success in Syria, the US will need to accelerate its preparations to attack Russia. Yet Barack Obama, the lame duck, cannot decide anything, and assumes that the next US president will make the decision. Where could the United States attack? The US does not target a landing in Russia's Far East. Instead, just like Napoleon or Hitler, the US intends to occupy Russia's strategically objective capital, Moscow. The initial plan was that the US-backed "Euromaidan" would draw Ukraine into its sphere of influence, and that the Russian naval bases in Crimea would be transferred to the US Navy, as Ukraine becomes a NATO member. The invasion of Russia was set to start from the territory of Ukraine. 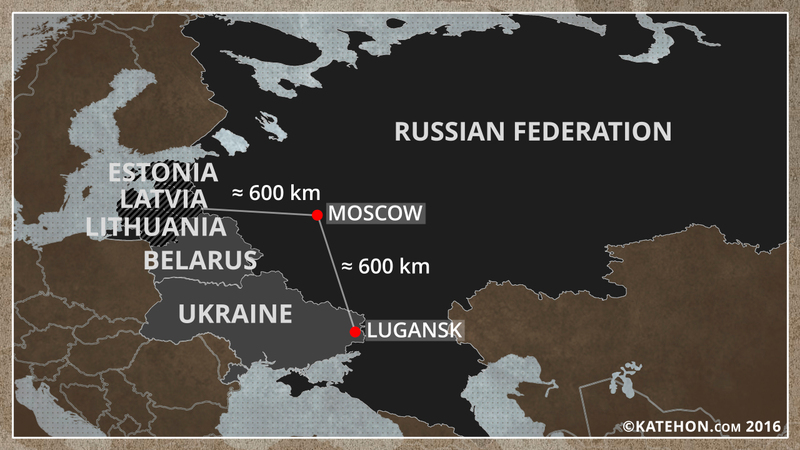 It should be taken into consideration that Lugansk, for example, is only 600 km from Moscow. The initial plan was overturned by the successful referendum that decided Crimea’s re-unification with Russia and, subsequently due to the civil war in Donbass, the Americans can no longer launch any military aggression against Russia from Ukraine. Therefore, the US’ plan was revised, and the Baltic states were designated to be the new offensive starting zone. For this reason, the US has recently put pressure on Sweden and Finland to join NATO, whose territory could be used for maneuvers in the challenge against Russia. Moscow is only 600 km from the border with Latvia and is not protected by any natural barriers that could put obstacles in the path of any invasion from a military point of view. Allegedly for "deterring" Russia, the Pentagon has enlarged military spending for the anti-Russian campaign in European countries bordering Russia. The US has even deployed yet another armored brigade in the Baltic states and Poland, thereby violating the Founding Act of the Russia-NATO Treaty of 1997 in addition to decisions to increase the US’ military fleet from 272 to 350 battleships. Therefore, the Pentagon's strategic plan might include a Blitzkrieg military invasion taken under NATO command, with classic weapons, starting from the Baltic States and Poland directly aimed for Moscow. The defeat of Russia would be followed by a change in the political leadership represented by Vladimir Putin and a gradual withdrawal of forces while leaving pieces of Russian territory occupied by Latvia, Estonia, and Ukraine. 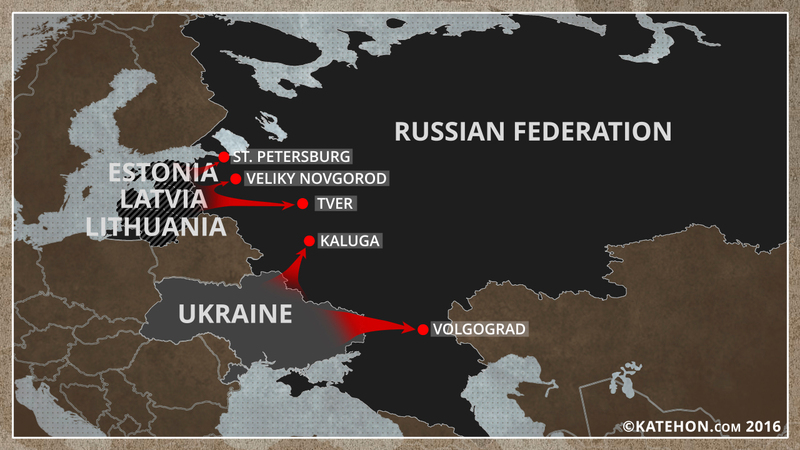 Russia’s western border would be fixed along the line stretching from St. Petersburg to Veliky Novgorod, Kaluga, Tver, and Volgograd. Due to the rapid modernization of the Chinese army, which is now capable of posing serious problems for the US and its allies in the Western Pacific, which would mean that the Pentagon would not deploy all available combat equipment in Europe. Up to 1/3 of the US military forces would be kept in reserve in the case of a surprise attack by China. What would be the time window? Any military invasion of Russia could be executed successfully by USA only before 2018, after which the chances of success drop dramatically given the Pentagon’s loss of technological superiority in many fields compared to the Russian Army and the possibility of the conflict turning into a global one involving the use of nuclear weapons. Russia’s army is focused on defense. It has high-performing aircraft interceptors and highly mobile AA missile systems capable of detecting and destroying even 5th generation US aircraft. Therefore, the US military, backed by its allies in NATO, will not be able to win air supremacy. With great effort, it could achieve partial air superiority for short periods of time on certain zones around the Russian border with a strip with a depth of 300 km. To create safe flight zones in areas where Russian anti-aircraft systems are active, the Americans would be forced to send a first attack wave of 220 aircraft (including 15 B-2 bombers, F-160’s, F-22A’s and 45 F-35’s). With two streamlined compartments, a B-2 can carry either 16 GBU-31 laser-guided bombs (900 kg), 36 CBU-87 cassette bombs, (430 kg) or 80 GBU-38 bombs (200 kg). F-22A aircraft can be armed with two JDAM bombs (450 kg) or eight 110 kg bombs. A major obstacle is that the Americans’ AGM-88E anti-radar missiles, with a radius of action of 140 km, are too large to fit into F-22A’s and F-35’s (length 4.1 m, 1 m tail) and if they are attached to the wing’s pylons, they instantly compromise the "invisibility" of these planes. The predominant targets of the first wave will be Russian airfields and systems in A2 / AD bubble exclusion zones. As for the F-22A, the Pentagon reports show that they were pleased with the results of F-117 (first aircraft generation 5-a) in the first campaign of the Gulf and in Yugoslavia. The Pentagon thus originally ordered 750 F-22A’s to replace the F-16 in the Air Force, but once American military intelligence discovered that Russia has successfully tested the 96L6E anti-stealth radar on F-117’s, the Pentagon reduced the order to 339 F-22A’s. While the Americans were developing and testing the F-22A project, the Russians had already created the antidote to this plane, i.e., the S-400 missile system that uses multiple-component detection equipment, including the 96L6E. In the end, only 187 F-22A’s came to be produced. To complicate the task of Russian air defense in addition to dealing with 5th generation planes, 500-800 cruise missiles from US ships and submarines deployed in the Baltic Sea would be launched. The chances of these cruise missiles reaching their targets are small, as Russia has about 250 MiG-31 long-range fighters that can reach a speed of Mach 2.83 (3500 km/h) which are specialized in intercepting E-3 Sentry (AWACS) plane and cruise missiles. The MiG-31s’ aircraft radar can discover incoming projectiles at a range of 320 km and follow 24 targets at once, eight of which can be simultaneously attacked with R-33/37 missiles with a range of 300 km and Mach 6 velocity. At the same time, US F-18, F-15E, B-52, and B-1B planes can fire without approaching the Russian border (and even without entering the range of action of S-400 missiles), which also concerns the AGM-154 or AGM-158 mini cruise missiles with a range of action of between 110 and 1,000 km. They can hit battleships of the Russian Baltic Fleet and Russia’s 9K720 Iskander (distance 500 km) and OTR-21 Tochka (distance 180 km) Iskander surface-to-ground missile batteries. In the best case scenario, the effectiveness of this first wave might mean the neutralization of 30% of Russia’s surveillance aerial radar system’s network, 30% of the S-300 and S-400 battalions deployed between Moscow and the border with the Baltic countries, 40% of the components of the automated C4I systems (especially radar-jamming components), as well as blocking airfields home to 200 planes and helicopters, thus damaging Russian operative management, etc. However, the expected loss of the Americans and their allies can reach 60-70% of aircraft and cruise missiles entering the Russian airspace during the first wave alone. But what is the largest obstacle to conquering air supremacy? Around the cities of St. Petersburg and Kaliningrad, the Russians have established two automated C4I systems (featuring automated Command, Control, Communications, Computers, Intelligence and Interoperability) to obtain supremacy in preventing radio-electronic war (Electronic warfare -EW) waged by American land-based, air, and cosmic surveillance systems. Among others, the C4I equipment includes the Krasukha-4 SIGINT and COMINT type (which can intercept all communication networks). The Krasukha-4 can also prevent radar surveillance from American Lacrosse and Onyx military satellites - military radars based on the soil of neighboring states of the AWACS and E-8C type, and those mounted on US RC-135 reconnaissance aircrafts or the unmanned Northrop Grumman RQ-4 Global Hawk. The Russian military is equipped to jam the enemy’s electron-optical sensors for laser-guided, GPS-directed, and infrared seeking bombs and missiles. Such systems are relatively few in number but in position to ensure the deflection of important enemy objectives. The deployment of Russian C4I systems also allows for the establishment of two exclusion zones (Anti-access / A2 Area Denial / AD Bubble) impenetrably by NATO forces. Moreover, the C4I are integrated into two battalions with S-400 long-range anti-aircraft missiles and several mobile batteries with short-range Tor-M2 and Pantsir-2M systems. In order to completely deter a Western invasion, Russia would have to begin to develop the continuity of C4I automated systems with the EW, A2/AD bubbles around St. Petersburg, along the border with the Baltic States, and in Kaliningrad. The S-400 system can track and attack up to 80 air targets with speeds of up to 17,000 km/h at a distance of 400 km using radar information from multispectral satellite-based sensors. Russia now has 20-25 battalions with 8 x 40 launch systems each for S-400 missiles (approximately 180 S-400 launch installations). Eight S-400 battalions are located around Moscow and one was in Syria. Russia could bring the other S-400 battalions up to the border with the Baltic states or position them in Belarus with 130 S-300 battalions equipped with approximately 1,100 S-300 launch installations (with an operating range of 200 km) which, although older than the S-400, are resistant to jamming, can feature upgraded PMU-1/2’s, and can be equipped with the 96L6E radar. The S-500, a more honed model of the S-400, is now in testing and will begin to equip the Russian army in 2017. Because of Russia’s highly efficient SIGINT and COMINT radar jamming and anti-electron-optical and anti-GPS equipment, which Russia has many of, NATO will not be able to gain supremacy in any kind of radio-electronic war (Electronic warfare - EW). It should be remembered how in Syria Russia’s C4I, EW, and A2/AD automated systems prevented the American anti-ISIS coalition from discovering rebels’ objectives before they were attacked by Russian bombers. In the case of a NATO attack on Russia, in the first wave the US is expected to hit 60 - 70% false targets on Russian territory. EF-18 jamming aircrafts and US Navy ships stationed in the Baltic Sea would secure the next wave of US air attacks. But, due to the weak air supremacy from the first wave, the next waves of the NATO attack would feature increasingly heavy losses. The US air group composed of 5,000 aircraft and helicopters belonging to the Air Force, Navy, and Marines would have to be joined by their NATO allies’ 1,500 aircraft.